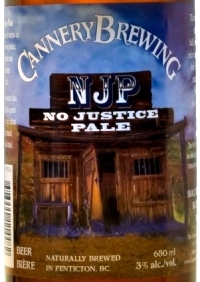 PENTICTON, BC – Cannery Brewing has announced the release of their lower alcohol No Justice Pale in bottles for the first time. Originally brewed as a draught-only product for Kettle Valley Station Pub in Penticton, this 3% ale was initially named No Jail Pale, but liability issues meant the name had to be changed for release in bottles. Cannery No Justice Pale is available now in 650 ml bottles at select liquor stores, and on tap at select restaurants and pubs in BC.